This video demonstrates the first steps concerning to how to build a softphone by using Ozeki VoIP SIP SDK. This tutorial is the 1. part of a 3-part video tutorial series, in which you can learn how to download and install Ozeki VoIP SIP SDK, then how to create a new Visual Studio project and write the source code (including creating softphone objects, initializing them, creating necessary events, executing SIP registration, checking the results etc.). To be able to use Ozeki VoIP SIP SDK, you have to download it from the website, and you also have to install it to your computer. E-mail: your e-mail address, where the support team of Ozeki will be able to reach you, in purpose to help you with your questions or problems. Why do you need this software: we would like to know about the reason of the usage of the SDK, since we would like to be notified about what features, opportunites should we provide in the future, what are the purposes of the users. After providing the necessary informations, you will be able to download the SDK's installer, called "Ozeki_VoIP_SDK". 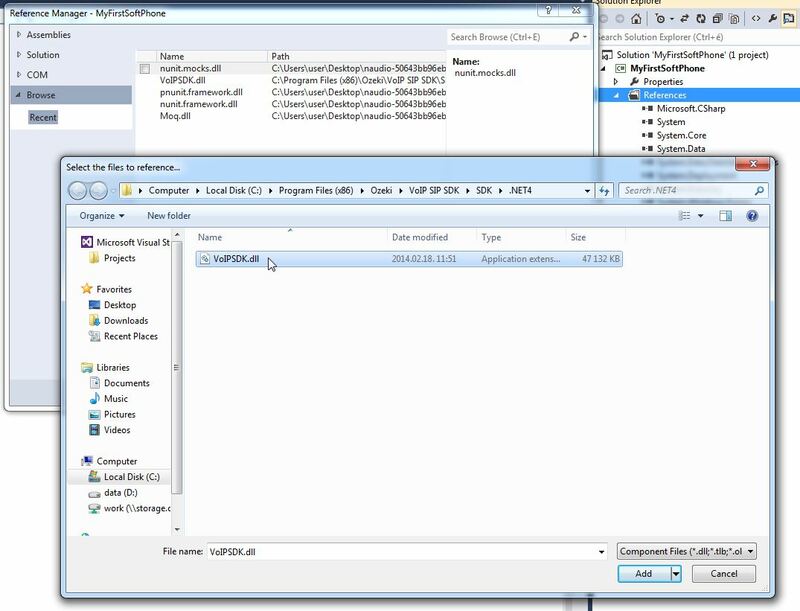 During the installation of the SDK, the installer will ask you about the installation's folder. It's recommended to do not modify the default path, but even if you do, make sure you will remember it, since you will need to use this path later. After the installation is complated, you are ready to open a new Visual Studio project. To create a new Visual Studio project, you have to start Visual Studio, than click on the File menu, and select the New menu's Project submenu. A new window appears, where you have to select Visual C# from the available Templates, and you need to select the Windows Form Application option. 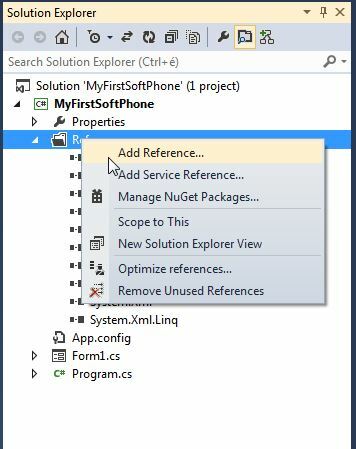 It's also recommended to rename your project to something more familiar, like this example renames it to "MyFirstSoftphone". you have to locate the installed ozeki.dll file, within the installation path, which is "C:\Program Files (x86)\Ozeki\VoIP SIP SDK\SDK\.NET4" by default. after ozeki.dll is located, select that, and click on the Add button, and close the Reference Manager window as well. After you've done the previous steps, you should be able to see a new entry at the end of the References in the Solution Explorer: VoIPSDK. For the purpose to be able to follow the events' results, navigate to the Design View, first. You can find this view by clicking on the View menu, than selecting the Design View submenu. From the Toolbox, drag and drop a new ListBox onto your Form. Please note that, you might need to incrase the size of the form, to make some space for later works. The application will put the event results into the ListBox as new items. It's recommended to rename the ListBox (and every GUI element) to something more familiar, for example; the guide renames it to "lb_Log". For this step, you have to switch to the Code View. If you can't see the correct tab for that, click on the View menu, and select the Code submenu. IPhoneLine phoneLine: the phone line object from the IPhoneLine interface. To set a phone line, you need to set a valid SIP Account and NAT Configuration (see below). PhoneLineState phoneLineInformation: you can follow the phone line's states (registered, timed out, registration failed etc. ), and you can set different methods to be executed in thoses cases. IPhoneCall call: the application manages the calls as objects. Microphone microphone: microphone object to capture audio data from microphone. It's also initialized with the default microphone device, by using the GetDefaultDevice() method of the Microphone class. Speaker speaker: speaker object to play audio data through speakers. It's also initialized with the default speaker device, by using the GetDefaultDevice() method of the Speaker class. MediaConnector connector: this object will create connections between different MediaHandlers, making it available to send voice data from a microphone throught the call, to the other party's speaker, in this example. PhoneCallAudioSender mediaSender: this object is used to send audio data to the attached call object. PhoneCallAudioReceiver mediaReceiver: this object is used to receive audio data from the attached call object. bool inComingCall: a boolean variable which indicates if there is an incoming call or not. These objects and variables will be initialized a few steps later, at the initialization of the softphone. You will se how to use this method during the next steps. This method logs the call's states as new entries to the lb_Log ListBox. You can get the current call state from the e.State's value, by calling its ToString() method. You can learn how to handle call states from the second tutorial. Within this method, you have to define the most of the previously defined objects, and you will also set how to register your softphone to a PBX. you have to define the softphone object with the help of the SoftPhoneFactory class's CreateSoftPhone() method. This method waits four parameters: your local IP address, a minimum and a maximum port, which are defining a port range, and a listening port. If you have any firewall rule which restricts the usable ports, you can set the usable port range here, which will be used during the calls. You can also log the softphone's creation to the lb_Log ListBox. registrationRequired: is the registration required or not? This field needs to be set to "true", if you would like to receive incoming calls. userName: if an other client dials this name (number), you are getting called. authenticationId: an identifier to the PBX, a login name. domainHost: a domain name, an IP address. You can also add a new entry to the lb_Log ListBox about the phone line's creation. when the phone line has been created, you have to call the RegisterPhoneLine() method to register the phone line to the softphone. If the registration is set to be required ("true"), this method will also send the SIP REGISTER command to the selected PBX. It's also a good idea to insert this method's body into a try block, to be able to catch the occured exceptions. In this example, the application only notifies the user about the incoming call, within the lb_Log ListBox. You can see how to work with call objects within the second tutorial. As you can see, if the registration was unsuccessful, the application also tells the reason of that. From this tutorial you could learn how to begin the softphone developement with Ozeki VoIP SIP SDK, and you can also try your softphone; run the application, and you can see if your softphone registers or not. If you gave valid informations at the SIP Account creation to reach the PBX and you set the correct NAT Traversal method, your softphone should register successfully.